At Appleseeds we understand that infants and toddlers have their own individual needs and each child develops differently. 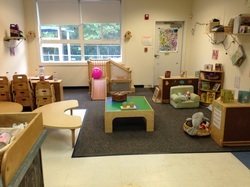 Our infant and toddler classrooms focus on developing secure trusting relationships with each individual child. Trusting relationships is the foundation for success in all other areas of development. When children have well established trusting relationships they learn how to communicate, are able to develop and maintain new relationships, build their self confidence, and feel safe to explore and learn. We not only want the infants and toddlers at Appleseeds to have trusting relationships with their teachers, but we want the same for their families as well. We have an open door policy with families. Nursing mothers are welcome to come in during the day to nurse. Each classroom has a direct extension. Parents are welcome to call to check in with the classroom teachers as often as they like. Communication is key. Our teachers work set schedules where one of the teachers is always there for arrival of most of the children in the class and the other teacher is always there until the close of the day. Parent are able to have face to face conversations about their child's day or development with their child's primary caregivers on a daily basis. 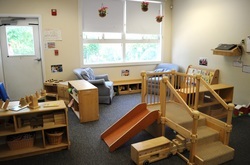 Recognizing that the first 5 years are when the most pathways to the brain are established, and that infants and toddlers are multisensory learners, we provide a variety of activities based upon each child's developmental stage. Music/movement and reading literature are daily activities in the classrooms. The infants have their own playground and we do try to take them outside daily, weather permitting. We incorporate sign language into our daily classroom experiences. As a way to help our infants and toddlers develop early literacy skills we use symbols with them. We ask each family pick a rubber stamp (often found in the crafts sections of stores) that is special to their child. This could be anything from a baseball to a butterfly, anything you want. The stamp is then placed on child's artwork, cubbies, with photographs of your child, and any other place where their name is written. Each child will begin to associate their stamp with their belongings and eventually their name in print from association. As the children understand this concept more, they begin to recognize their friend's symbols and names in print. When the children show signs that they are ready, the symbols are removed from next to their names in print. We follow Creative Curriculum's Goals and Objectives for Infants and Toddlers to guide our curriculum. Creative Curriculum is backed by many years of research for best practices in early childhood education and is aligned with NAEYC Criteria.